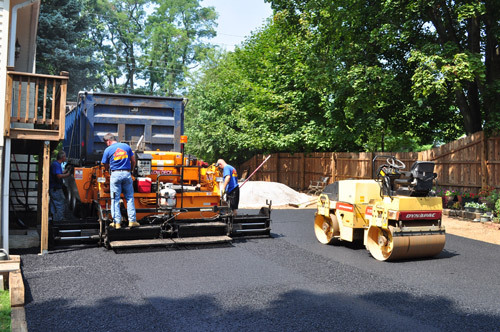 Malvern Paving Contractor | C Schaffer Contractor, Inc.
C. Schaffer Contractor, Inc. is a family owned and operated asphalt paving business based in Malvern, PA. We have been serving Chester County and surrounding areas for over 30 years, paving driveways, pathways and parking lots. Our high quality residential and commercial services and competitive pricing have created a strong customer base from which we receive many referrals and repeat business. We are committed to absolute customer satisfaction and take great pride in our work. When you contact C. Schaffer Contractor for an estimate, owner Chris Schaffer will personally return your call the same day and arrange a time that is convenient for you to meet. On the day the job, Chris will be on site with his hard working and professional crew to complete your work. A well paved driveway should last about 15-20 years. If your driveway is cracking or there are depressions leading to puddles of water it is probably time for a new driveway. Parks, golf courses and other commercial properties use pathways to navigate their landscape. C. Schaffer Contractor specializes in paving these type of pathways. C. Schaffer Contractor repaves parking lots for local businesses, churches and other commercial buildings.